A couple of weeks ago, I received an email from Frank Eriksen, who produces the All Things Boulder podcast (which is a really cool show, by the way). In the email, Frank asked me if I had any ideas why my podcasts sound “so much better sonically (louder/cleaner)” than his show. I listened to a few of Frank’s episodes, and here’s what I found. 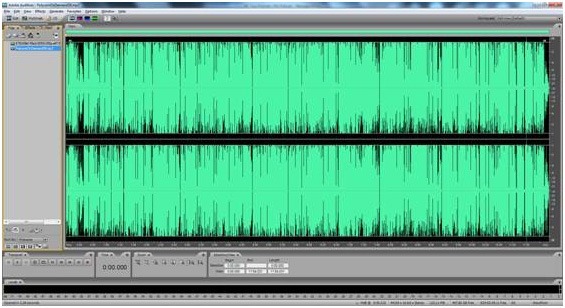 The major problem I found is that you are not compressing/limiting your audio files. 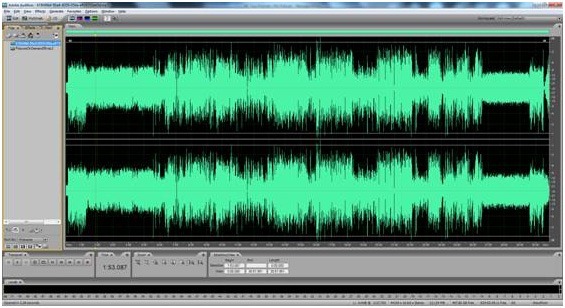 If you were to open any of my audio files in a program like Audacity or Adobe Audition (or any other audio editing software), you’ll find that the amplitude of everything is exactly the same. It’s set to -1.0db, which is just below distortion. I provided Frank with a couple images–one that showed what his show looks like and one that shows what one of our Polycom on Demand episodes looks like. See the difference? It’s that roller coaster effect (LOUD. . .quiet. . .LOUD. . quiet. . .LOUD) that’s causing the problem. I have a custom built Digital Audio Workstation I use for all my audio recordings (and audio feed to the Tricaster). For the main outs of my recording software (Cakewalk’s Sonar. . .which is the same software I used to record all my music CDs), I use a VFT plugin that is a mastering limiter. It adds gain when needed and at the same time limits the output to -1.0dB. That way, all content (me, my co-host, phone-based guests, Skype-based guests, audio-clips, sound effects, bumpers, songs, etc.) all are played at the exact same level. Also, because my voice is pretty deep/boomy as it is, I also add a 5.3dB gain of EQ at the higher end (1980Hz). This is done within the DAW software as well. If you’re wondering why your audio isn’t as rich/full as you’d like, take a look at your waveform. . .are you seeing a roller coaster? If so, create an even better sounding file (and make it easier for your fans to comfortably listen as well) by applying some limiting/compression yourself!